Put the chicken and marinade ingredients in a bowl and cover. Put in the fridge for at least two hours. If your children are 5 or over, you can get them to roughly chop the pepper, roasted pepper, apple and tomatoes for the salsa using a good quality firm plastic knife or cutlery knife. Otherwise do this yourself. Younger children can pick the leaves from the coriander and mix them into the salsa. Tip the salsa ingredients into a food processor, along with the lime juice and a little seasoning and pulse until finely chopped. Take out 2 large spoons of the mixture for younger children, then add chilli sauce, if using, and pulse again to combine. Heat a little olive oil in a frying pan and pour the contents of the chicken bowl into the pan. Cook for 5- 8 minutes or until the chicken chunks are cooked through. Put the grated cheese, salsa (for grown-ups and children), guacamole and sour cream in separate colourful bowls to put on the table. Grown-ups: Heat the tortillas according to the pack instructions and put the cooked chicken in a bowl. 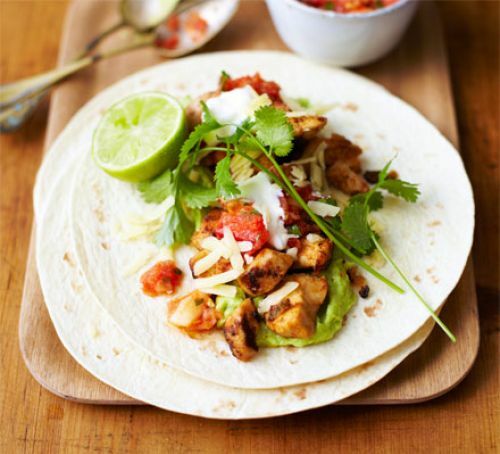 Show children how to fill and roll their tortilla. Lay out your tortilla, choose your toppings, roll them up and eat!